Marine lumber is easy to machine with carbide-tipped router bits. If you need to replace wood, plastic laminate, or plastic parts on your boat, consider using Marine Lumber. Sometimes called “StarBoard,” Marine Lumber is great for projects like cutting boards and bait boards, shower floors, companionway hatch boards, sink covers, cabinets and electronics boxes, bait wells, table tops and literally hundreds of other applications. Available in thicknesses of 1/4", 1/2", and 3/4", this polyethylene polymer sheet product will not rot, splinter, swell or delaminate. Marine Lumber can be machined with standard woodworking tools and needs no painting, finishing, or maintenance. Marine Lumber is widely used by professional boatbuilders. If your boat was built in the last 15 years, it probably has Marine Lumber parts somewhere onboard. This article will outline the characteristics of this versatile building material and perhaps inspire some creative do-it-yourself projects. Marine Lumber is not a structural building material. Don’t consider replanking your wood boat, replacing your plywood deck or installing engine stringers using Marine Lumber. It needs to be supported every 15" to 18" in every direction, and it does not have the stiffness or strength of good marine plywood. Marine Lumber is FDA approved and safe for food preparation. It has a non-stick matte finish, is nearly impervious to UV radiation and does not absorb water. It cannot be painted, must be mechanically fastened and is very difficult (or nearly impossible) to glue. It can be thermoformed, or bent to a desired curve, by heating both sides to 210-220°F at the point of bending. Clamp it on a workbench with the end you want to bend hanging over the edge. Pass a heat gun back and forth while bending the Marine Lumber down. It can also be welded, using standard HDPE welding equipment and practices. The best news for the do-it-yourselfer is Marine Lumber’s ease of cutting, routing, and shaping. It machines just like wood. Straight cuts are made using a carbide-tipped 50 to 70-tooth wood cutting blade on your table saw or worm drive. Curved cuts are easy to make with a jigsaw or bandsaw, with a wood cutting blade. Clean up edges after you cut with a router, using a flush-trimming bit. You can use a router for rounding-over edges, cutting rabbets and dadoes, or making tongue-and-groove joints, for example. Carbide-tipped router bits give the cleanest results. You can also make a clean 90° waterproof corner using a 3/4" 90° "V" bit. Cut a V halfway through the thickness where the inside of the bend is going to be. 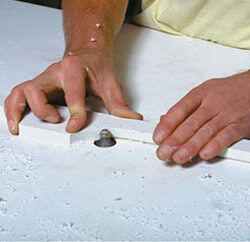 Use a heat gun on low setting to apply heat evenly to the seam, while applying pressure to bend the panel. Allow the joint to cool, and you will have a perfect 90° waterproof corner. You may want to try this out on a piece of scrap Marine Lumber before attempting a larger corner, so you can get a feel for the process and avoid wasting material. Sanding, for cleanup purposes, works well with an orbital or random-orbital sander, loaded with 120 or 150 grit paper. 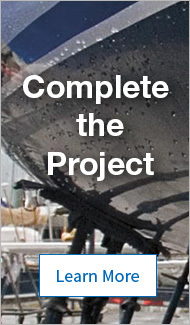 Use stainless mechanical fasteners to secure pieces of Marine Lumber in place. Poly-Dura is one of the few adhesives with any ability to bond this material, but screws or thru-bolts are recommended because Marine Lumber does not glue reliably. Epoxy and polyester resins, polyurethane or other adhesives do not stick securely, and will eventually pull loose. Marine Lumber can be caulked with BoatLIFE Life-Calk, for above-water use. 3M 5200 also adheres well enough for caulking, but not tenaciously enough to be used as an adhesive. Fastener holes almost always must be drilled oversized, because Marine Lumber expands and contracts with changes in temperature. It moves 1/32" per linear foot per 40°F of temperature change, so fastener holes are usually drilled 1/8" larger than the fastener’s diameter. If you are attaching Marine Lumber to wood, fiberglass, or other more dimensionally stable surfaces, drill a correctly sized pilot hole into the substrate, and oversize the hole in the Marine Lumber. If you forget to oversize the fastener holes, and you assembled your project in cold conditions, your Marine Lumber could sag in the summer heat. Assembly in hot weather could lead to cracking across the fastener locations when the Marine Lumber contracts at lower temperatures. Of course, solid wood lumber also expands and contracts, and in more unpredictable ways, depending on the species of wood, the grain direction, and the moisture content, so Marine Lumber has the advantage of predictability. Marine Lumber also softens at temperatures above 180°F, so it should not be used in engine compartments or other locations subjected to extreme heat. If you choose to counter-bore your fastener holes, you can hide the fasteners with plugs you make from Marine Lumber, just like you can when building with wood. Use a plug-cutting bit the same diameter as the hole you are plugging, and measure the depth of the hole you need to fill using the depth gauge on a dial caliper. Cut a piece of scrap Marine Lumber to the right thickness, placing the matte finish side against the fence of the table saw. Clamp your Marine Lumber plug stock to the table of your drill press (with matte finish side down, and a piece of scrap lumber underneath), and drill out the number of plugs needed, plus a few extra. Deburr and clean the plugs. Insert the plugs into the fastener holes, starting them with your fingers and tapping them into place using a hammer, with a block of wood or plastic in-between. You should now have a finished installation with virtually invisible plugs. Projects using Marine Lumber range from replacing damaged wood, laminates and plastics, to adding personalized accessories. To Replace Worn or Damaged Wood: Remove the old part. Use the old part as a template by clamping it to Marine Lumber. To Add New Accessories: Choose the accessories you would like to make. Determine where they will be located on the boat and create a pattern if you don’t have one, including the location of the attachment holes. 1. Calculate the size of the Marine Lumber Sheet you will need by laying out your patterns. 3. Purchase the appropriate size Marine lumber sheet at your local West Marine store or order from our warehouse. 1. Clamp your old part to the Marine Lumber, or tape your template to it with scotch tape and make an outline using a WAX PENCIL. 2. Cut the outlines of the wax pencil using a table or circular saw for straight cuts, a jigsaw for curved cuts and a drill with hole saw blades for large holes. TIP: Never use lead pencil, ink pen, magic marker, etc. on the unprotected surface of Marine Lumber. These items will permanently stain the marine lumber. Cut holes and notches in the components first before cutting them out of the Marine Lumber sheet. All cutting tools should be carbide tipped if possible. Circular blades should have 50-70 teeth and run at approximately 1200 rpm. When drilling, Marine Lumber gets hot. Stop frequently to let it cool down. 3. Finish all edges using a router with a 1/2" carbide bit with at least two flutes or an orbital sander with 120 grit sandpaper. 4. If you are bending the Marine Lumber to create a corner, you can place it on top of a piece of plywood so that the bend line is just past the edge. Heat it with a heat gun across the bend line allowing the part extended over the edge to bend downward. If you are bending it in place, secure with clamps and apply heat with a heat gun. Start at the clamped end, gradually apply pressure and work in one direction. TIP: If you want to create sharp corners, you can make a V shaped notch on the inside of the bend line with a router before bending. 5. Drill the attachment holes in the Marine Lumber using a drill bit slightly larger than the mounting screws or bolts to allow for expansion and contraction of the Marine Lumber. For best results, use a sharp, high-speed drill bit. Countersink the holes with a countersink bit to allow the screw heads to be flush with the surface of the Marine Lumber. If you are going to counterbore the holes, it should be no deeper than 1/3 of the thickness of the Marine Lumber. 1. Hold your accessory in position and drill through the mounting holes into the surface you are mounting it to. Make sure the drill bit is smaller than the mounting screws or bolts so the threads will grip, unless you are through-bolting. 2. Install your accessory using fasteners. Coat the threads with a silicone sealant or 3M 5200 before installing them to create a watertight seal. TIP: Most sealants and adhesives will not adhere to Marine Lumber. 3M makes one that will work. It is called Scotch-Weld DP-8005. If you are bolting Marine lumber to another surface and need to make a water-tight seal, you can use 3M 5200 or one of TACO’s weather seals. Both will act as sealants only, not adhesives.